It is not uncommon for women to experience some feelings of depression and anxiety during menopause. However, when either feeling becomes constant and overwhelming, it should be addressed. Continue reading to gain a broader understanding of depression and anxiety during menopause as well as how to treat both conditions for an improved quality of life. Can Menopause Cause Depression and Anxiety? All throughout women's reproductive lives, estrogen has played an instrumental role in their mental well-being and overall health. When ovaries begin to wind hormone production, drastic fluctuations of estrogen and other key hormones ensue, thus leading to mental health issues, such as depression and anxiety, during menopause. 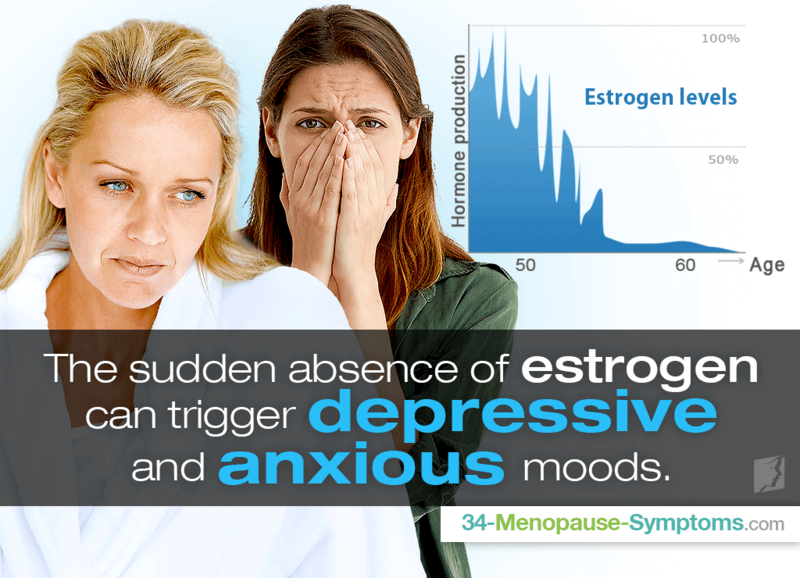 While depression and anxiety can be caused by other factors, such as medical conditions, alcohol and drug abuse, and more, this sudden absence of estrogen can trigger depressive and anxious moods. Moreover, even though some women are looking forward to this transition into a different stage of life, it is possible they may also be experiencing depression and anxiety during menopause from significant life events. They could be feeling loneliness from children leaving the house, prolonged sadness for the end of their fertile years, or stress from changes in household responsibilities. It is not always possible to completely avoid anxiety or depression during menopause. Get more social. A strong support system can help you feel more connected not only with yourself, but with those around you as well. Have more frequent get-togethers with friends who may be going through the same as you. Practice stress-relief techniques. Deep breathing exercises and mediation are renowned for helping bring your attention back to the present, thus dissipating any feelings of anxiety creeping up on you. They also help lower cortisol levels, the hormone responsible for stress. Exercise regularly. Exercising promotes the release of endorphins, which evoke positive feelings in the body. Strive to work out for five times a week, 30 minutes a day, participating in activities such as swimming, yoga, walking, water aerobics, and more. Get outdoors daily. Spending time in nature has been proven to reduce stress and anxiety and help those who are feeling depressed. Getting outdoors has also shown beneficial effects on depression. So, get up and out and enjoy some long, deep breaths of fresh air. The best way to address depression or anxiety during menopause is to treat the root cause of hormonal imbalance. To naturally go about doing so, consider wholesome lifestyle habits paired alongside the use of herbal supplements proven effective for years. Click on the following link to learn more about depression treatments and how you can go back to feeling like yourself again in no time. This article looks closely at the evidence that links these two phenomena. Depression is relatively common in middle-aged women. This article explains in more detail the link between middle -age and depression. Menopausal Depression: Should I Be Worried? Depression is a common symptom of menopause and should be treated professionally.